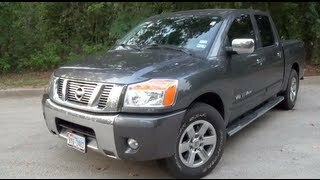 Since the first model was released on the North American market back in 2004, the Nissan Titan has received very little criticism during these past few years. 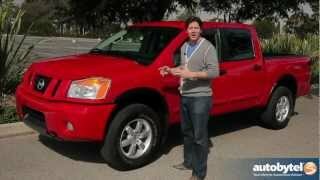 However, the Nissan Titan 2012 offers little improvements compared to its predecessors and it might not be looked upon with the same eyes as before. Few customization options are offered by the Nissan Titan 2012, and it comes exclusively with a single engine option, the same 5.6 Liter DOHC Endurance V8 found in the previous model, capable of producing 317 horsepower and 385 lb-ft of torque. Truth of the matter is that this engine was highly acclaimed when it was first used on the Nissan Titan, but unfortunately it's starting to show its age. The Nissan Titan 2012 is offered in two body styles, the King Cab or the Crew Cab, rear or all-wheel drive, a standard 5-speed automatic gearbox and a maximum towing capacity of 9,500 pounds for the King Cab, and 9,400 pounds for the Crew Cab. The King Cab body style offers an innovative feature which allows the rear doors to open at 169 degrees. The Nissan Titan 2012 has received a few enhancements here and there in order to differentiate itself from its predecessors and it's offered with additional options such as three different bed lengths, four trim levels (the S, SV, PRO-4X and SL), and the optional "Flexible Fuel Vehicle" feature which will enable the Titan to run on E85 Ethanol. The SV variant comes with the all new Sport Appearance Package which consists in a set of 20-inch alloy wheels and body colored bumpers. The PRO-4X variant comes with silver stitching on the seats, fog lights, white-faced gauges and a lockable bedside storage compartment. On the interior, the Nissan Titan 2012 comes in two configurations, the six-seat variant featuring a bench seat with column shifter, or the five-seat configuration which comes with two front bucket seats, a floor shifter and a center console. As far as pricing goes, the Nissan Titan 2012 has a base price of $26,800, but it can go up to about $40,000 with all the optional extras. 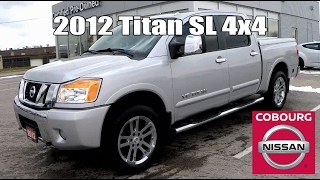 Compared to its competition the Chevrolet Silverado 1500, Toyota Tundra or the Ford F-150, all of which can offer a wider variety of engine and cab/bed configurations, the Nissan Titan 2012 is roughly $3000 cheaper than the Silverado, and $3000 more expensive than the F-150. But in this case, the automaker, which is based in Franklin, Tenn., a suburb of Nashville, where the Tennessee NFL franchise plays, is offering to “make,” or rather, “build” Manning a 2012 Nissan Titan Pro-4X pickup truck. On its website and Facebook page, Nissan extended the offer in an open letter to Manning. In an effort to remain neutral, Nissan indicates it will make Manning a Titan regardless of the NFL team he chooses. Tennessee has been the corporate headquarters for Nissan’s operations covering all of North, Central and South America since 2006 when the company moved to Nashville from California. The company, now based 15 minutes south in the suburb of Franklin, Tenn., is one of the state’s largest employers. Nissan operates technical and design centers in California, Arizona and Michigan, two assembly plants and one powertrain plant in Tennessee, as well as a third assembly plant in Canton, Miss. Manning played college football for the University of Tennessee. He is expected to be a first-ballot Hall of Fame inductee when he becomes eligible after retirement. The NFL Hall of Fame is located in Canton, Ohio. We hope it’s okay to be informal and call you Peyton. You’ve been like one of the family to sports fans, especially Tennesseans, since your record-setting college days at the University of Tennessee. Like you, we at Nissan North America were not all born to Rocky Top. But it is now home to our corporate headquarters and three manufacturing facilities employing more than 6,000 Tennesseans. At Nissan, we too have fans all over the U.S.A. and we appreciate them all. And like all of your fans, we’re awaiting your decision on where to play next season. While we are in no position to sign you to any particular NFL franchise, we at Nissan North America want to make you a Titan – a 2012 Nissan Titan – as a gesture of gratitude recognizing your great accomplishments and philanthropic contributions to our national community. We extend this offer on behalf of a nation of football fans and Nissan fans, not necessarily to influence your decision. So next time you’re in Nashville, give us a call and we’ll bring the keys. Innovation that’s tough, including the first-in-class Utili-track™ cargo carrying system, available durable spray-in bedliner, lockable bedside storage compartment, Wide-Open rear doors (King Cab), and the longest Crew Cab bed in class. That’s the hallmark of the 2012 Nissan Titan full-size pickup, which stands as a rugged, reliable, spirited choice for active truck buyers seeking style and excellent value. Titan is a truck designed to get the job done, whether that job entails hauling cargo, a trailer or just family and friends. For 2012, Titan offers a range of body, bed and drivetrain configurations to fit a range of buyer needs and uses: King Cab and Crew Cab body styles, a choice of 4x4 and 4x2 drive configurations, two wheelbases (138.9 inches and 159.5 inches), three bed lengths, and four well-equipped trim levels – S, SV, PRO-4X and SL. Titan is also available as a Flexible Fuel Vehicle (FFV) designed to run on E85 Ethanol. Titan is built on Nissan’s rugged F-Alpha pickup platform, featuring a powerful 5.6-liter DOHC Endurance V8 rated at 317 horsepower and 385 lb-ft torque and a standard 5-speed automatic transmission. Titan has a maximum towing capacity of up to 9,500 pounds for King Cab and 9,400 pounds for Crew Cab (when properly equipped). In the Americas, Nissan's operations include automotive styling, engineering, consumer and corporate financing, sales and marketing, distribution and manufacturing. Nissan is dedicated to improving the environment under the Nissan Green Program and was recognized as an ENERGY STAR® Partner of the Year by the U.S. Environmental Protection Agency in 2010 and 2011. Nissan Motor Co., Ltd., Japan's second largest Japanese automotive company by volume, is headquartered in Yokohama, Japan and is an integral pillar of the Renault-Nissan Alliance. Operating with more than 150,000 employees globally, Nissan provided customers with more than 4 million vehicles in 2010. With a strong commitment to developing exciting and innovative products for all, Nissan delivers a comprehensive range of fuel-efficient and low-emissions vehicles under the Nissan and Infiniti brands. A pioneer in zero emission mobility, Nissan made history with the introduction of the Nissan LEAF, the first affordable, mass-market, pure-electric vehicle and winner of numerous international accolades including the prestigious 2011 European Car of the Year award.